As a generality, work and technical processes are used to change materials to produce a desired result (e.g., reshape metal, bake a cake, assemble an appliance, separate hydrocarbons into various components, create a chemical change). Generally, the quality of the output product remains constant. Sometimes a change in the quality of the input materials creates the need to adjust the work or technical process to achieve the desired output. 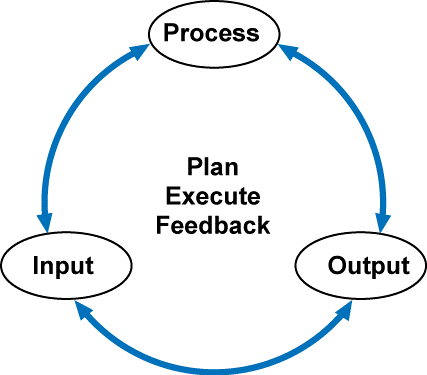 Input, process, and output can be thought of as a continuous loop. One can start at any point in the loop and go in either direction to plan, execute, and get feedback. Starting with output is a natural starting point because the objective or result must be understood before considering how to achieve those results. After having used the strategy to initially think though the work, a different starting point and sequence can be used to get a better understanding of a specific concern. The goal is to continually refine and improve safety, efficiency, and cost-effectiveness in achieving the desired results. Each variable must be measurable either using numerical units and ratios or non-numerical units. Examples of numerical units and ratios are 3600 revolutions per minute, 130 degrees Fahrenheit, 325 centimeters long, 2 parts water to 5 parts of pulp. Examples of non-numerical measurements are the water appears clear and put just enough force on the board to get a clean cut but not so much to overload the motor. To control the technology and make decisions, one needs to know the characteristics of the variables as shown in the matrix below. Knowing whether an equipment or material variable can change and whether or not the change can be controlled is very helpful in doing jobs well and responding effectively to changes. One must also understand the cause(s) or reason(s) for changes and how changes can impact PEMEO (defined in a previous post). Asking questions about the variables can be very useful for performing work and understanding and controlling technology effectively. The detailed content can then be organized in the same order presented in the introduction. The books EquipThink and MatThink provide detailed information about thinking strategies to plan work, do work, use technology and materials effectively, efficiently, and safely, and to make effective decisions. Using thinking strategies contributes to exemplary employee performance which, in turn, can improve job and corporate performance. The books use an educational design and have exercises to apply the thinking to the world of work. Do you use the input-process-output model when thinking about work or operating and maintaining technology? Do you think this model is a useful thinking strategy in your personal life? Do you think that the input-process-output model is useful for communicating how technology works and to structure training?